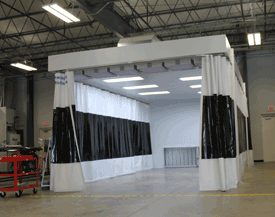 Garmat® USA offers a full line of Aluminum Repair and Isolation Stations for your specialized processes. From standard curtain enclosures to full lit ceilings. Garmat can customize a solution that can evolve with your shops ever changing needs. Features Garmat proprietary Fortex spark arrestors. AlumaSAFE Grinding Stations – Available in pressurized and non-pressurized models, with either closed lit ceilings, or open ceilings. A collection modular designed specifically for grinding aluminum. The modular as illustrated is shipped assembled with motor, fan, filters, and spark arrester panels to prevent possible fires from hot aluminum debris. Railing design allows curtains to be moved to the back of the module when not in use.